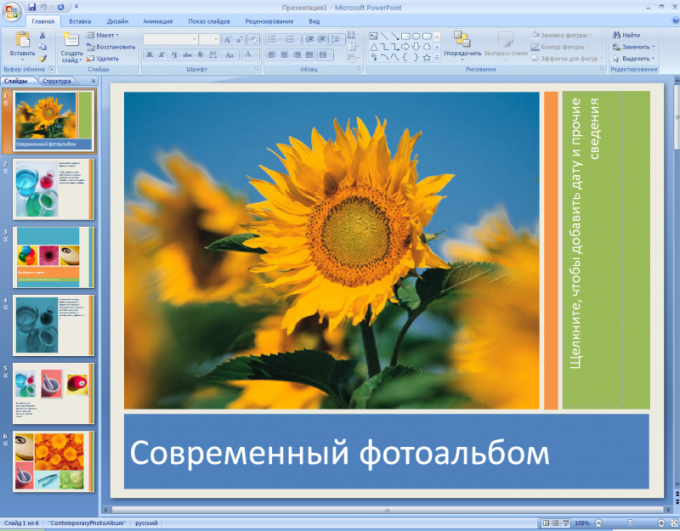 PowerPoint is the most popular tool for creating presentations. This program has an extensive set of tools for creating high quality slides and presentation materials. The application has an intuitive interface that allows you to quickly get started with the program settings. - installed package of Microsoft Office. Open Microsoft PowerPoint. It is included in the mandatory package installation of Microsoft Office and after installation via menu "start". Go to All programs - Microsoft Office – PowerPoint. In Windows 8 to browse to the application you can use the Metro interface by clicking in the lower left corner of your desktop and typing in the search dialog that appears PowerPoint. After starting the application you will see the title slide, which will cover for your presentation. Edit it according to your needs by typing text in a special field. To create the second and subsequent slides use the button "new slide" on the left side of the program window. The button is located in the Home tab of the top toolbar of PowerPoint. To select the slide layout when creating it, click on the triangular arrow that appears right under the button "new slide". Select the required slide layout and click the left mouse button. Created slide will appear immediately after the title and will contain fields for entering title and text. To change this layout, click the Home tab and then click "Layout" under "Slides" of the top panel. Then select to embed your content layout and type the text. Again, click the "new slide". Will create a new page which will have the same layout as the slide that you created before. To create a slide between two existing ones, click the location on the left pane for which you want to add it. After that, click "new slide". You can also move the created sheets using drag & drop, changing their order. To create a new page by clicking the right button on the slide after which you want to insert a new page, and then in the context menu select "Create".